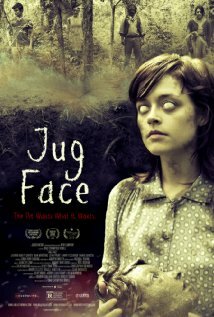 I’m very impressed with Jug Face, an absorbing and shockingly original jolt of indie-horror from writer-director Chad Crawford Kinkle. 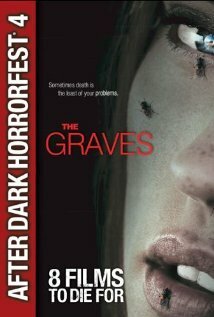 I would almost venture to call it “magical realism” but that term fails to capture the profound depths of despair plumbed by teen protagonist Ada (Lauren Ashley Carter) as she tries desperately to escape her awful fate as a sacrificial offering to a nameless creature that lives in a nearby pit and serves as a protector to a bunch of moonshine-brewing hillbillies. Jug Face is indeed mighty grim stuff. Somewhere in the Appalachians, a degenerate community of yokels lives off the grid, dependent on sales of white lightning and dutifully tending the thing in the pit to maintain their squalid existence. Ada, who has an arranged marriage to a doughy village boy in her future, is in love with her sullen brother Jessaby (Daniel Manche) who knocks up the unlucky lass whilst they’re cavorting in the woods. Meanwhile, the thing in the pit is unhappy and Dwai (Sean Bridgers), the village idiot savant/high priest can’t figure out what’s wrong. Normally, when the god is restless, Dwai is compelled to bake a jug that looks like one of the villagers, who is then sacrificed to the deity. So not only is Ada facing a loveless marriage while carrying her brother’s baby, but it appears she’s next on the pit parade. The filth and blind ignorance in this hick settlement is so thick you’d need a weed whacker to get through it. And it’s the act of “committing a sin” in such a terrible, unforgiving environment that accounts for the real horror in Jug Face, more so than the angry Lovecraftian god in their midst. Poor Ada tries everything she can think of to avoid the pit, but the superstitious ties that bind (and strangle) these slack-jawed citizens are simply too strong. Reminiscent of Winter’s Bone, another film about an isolated community with its own strict code of behavior, Jug Face is like an anthropological field trip—or a bad dream induced by a late-night order of pepperoni pizza. In either case, you’ll be very grateful to wake up safe and sound in your own bed. Based on the 2003 Korean ghost story A Tale of Two Sisters, The Uninvited is a taut, effective spook show that’s told with admirable restraint and subtle finesse, with an ending that will likely pull the rug out from under you. Yes, you’ll be able to figure out some of the plot twists, but probably not all of them. Traumatized teen Anna (Emily Browning, who’s excellent) is released from a mental hospital almost a year after the night her bedridden mother died in a fire at the boat house of her family’s ocean-view estate. Upon her return, her older sister Alex (Arielle Kebbel) fills her in on current events, namely, that their writer father Steven (David Strathairn) is knocking boots with Mom’s former caregiver Rachel (Elizabeth Banks). The sisters suspect Rachel had a hand in their mother’s fiery demise, and set about proving it, before the wicked nurse can become their wicked stepmother. This oddball entry was the last movie in Hammer Films’ Frankenstein cycle that starred the incomparable Peter Cushing as the most infamous mad scientist of all. 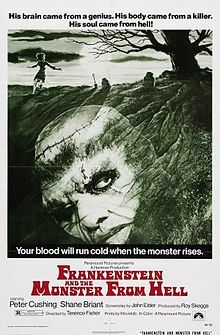 Judging by the sets and the sketchy monster makeup, it was certainly a low-budget affair, but for sheer audacity and inspired lunacy, Frankenstein and the Monster From Hell deserves a place alongside better-known examples of Hammer/Cushing greatness like Curse of Frankenstein and Evil of Frankenstein. Seriously, give it a chance. Young surgeon Simon Helder (played by bored Sting lookalike Shane Briant—by far the most emotionally blasé mad scientist that I can recall) is sentenced to an insane asylum for experimenting on corpses and discovers that the man in charge is none other than his mentor in madness, Victor Frankenstein (Cushing). Together they make use of body parts donated by expired inmates and fashion a creature that resembles a simian drag queen version of George “The Animal” Steel. The pitiful “monster from hell” does very little to earn such a fearsome sobriquet, and it’s really up to Cushing in a foppish blond wig to carry the movie—which he does admirably. Despite the low horror quotient, veteran director Terrence Fisher doubles down on the atmosphere, including a fairly excruciating brain-transplant sequence that gives Frankenstein and the Monster From Hell some much-needed shock value. It’s no triumph, but for acolytes of Cushing and the Frankenstein oeuvre, it shouldn’t be missed. Note: The monster is played by none other than David Prowse, who would ascend to immortality as the man in the Darth Vader suit in a series of films conceived by George Lucas.